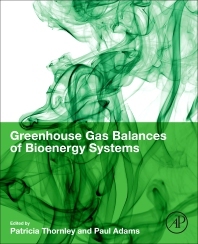 Greenhouse Gases Balance of Bioenergy Systems covers every stage of a bioenergy system, from establishment to energy delivery, presenting a comprehensive, multidisciplinary overview of all the relevant issues and environmental risks. It also provides an understanding of how these can be practically managed to deliver sustainable greenhouse gas reductions. Its expert chapter authors present readers to the methods used to determine the greenhouse gas balance of bioenergy systems, the data required and the significance of the results obtained. It also provides in-depth discussion of key issues and uncertainties, such as soil, agriculture, forestry, fuel conversion and emissions formation. Finally, international case studies examine typical GHG reduction levels for different systems and highlight best practices for bioenergy GHG mitigation. For bringing together into one volume information from several different fields that was up until now scattered throughout many different sources, this book is ideal for researchers, graduate students and professionals coming into the bioenergy field, no matter their previous background. It will be particularly useful for bioenergy researchers seeking to calculate greenhouse gas balances for systems they are studying. I will also be an important resource for policy makers and energy analysts. Patricia Thornley is a chartered physicist with over 20 years’ experience working in bioenergy in industry and academia. She was involved with engineering implementation of many of the UK’s early bioenergy plants, but is now based at the Tyndall Centre for Climate Change Research at the University of Manchester. Patricia leads the £12.8 million EPSRC SUPERGEN Bioenergy Hub, which aims to bring together industry, academia and other stakeholders to focus on the research challenges associated with delivering sustainable bioenergy systems. Her personal research interests focus on the environmental, social and economic impacts of bioenergy systems in the UK and overseas and how these can be practically managed to deliver sustainable bioenergy systems. She has worked extensively on greenhouse gas balances of bioenergy systems with several published journal papers on related life cycle assessment, but is also very active in policy and industrial engagement: working with policy stakeholders to inform methodologies for GHG assessment as well as with industrialists advising on and carrying out practical sustainability assessments for global bioenergy supply chains. She is also editor of the Elsevier Journal of Biomass and Bioenergy, has recently co-ordinated a special edition for that journal. Paul Adams, PhD, is a Research Officer in EPSRC’s SUPERGEN Bioenergy Hub and the Department of Mechanical Engineering at University of Bath, where he also teaches on the Energy & Environment and Integrated Environmental Management courses. He is currently working on several environmental and economic assessment and modelling research projects within the Sustainable Energy Research Team (SERT). Specifically, he is leading two work packages within the SUPERGEN Bioenergy Research hub, a research collaboration between several industrial and academic partners, assessing different bioenergy systems using life cycle assessment, and through the development of environmental/economic models.